Eerie Themes no. 6. 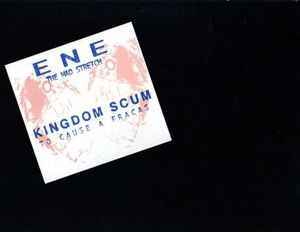 ENE side is 33 RPM; Kingdom Scum side is 45 RPM. The runout grooves say (on the A-side) "POLITICIANS ARE IN SEASON" and (on the B-side) "MODIFIED FOR THE SONS OF E.N.E. VERSUS DETUNE"